The deal between the two parties was signed on May 21. Photo: Hitachi. 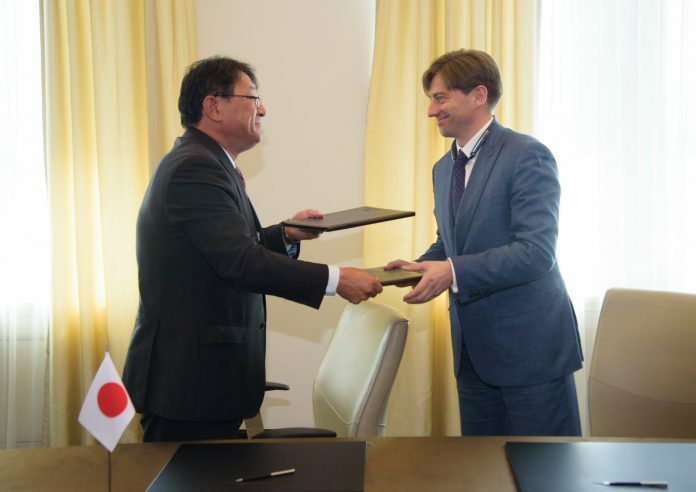 The largest manufacturer of locomotives and rail equipment in Russia has teamed up with one of its Japanese suppliers. Transmashholding and Hitachi have signed an agreement to form a joint venture (JV) and localise the production of traction inverters for passenger rail vehicles in Russia. Inverters convert DC electricity to AC. Hitachi currently provides electric components for the Russian company’s subsidiary Metrowagonmash and its projects in: Sofia, Bulgaria; St. Petersburg, Russia; and Budapest, Hungary. Signing the deal, Hitachi’s deputy chief operating officer for rolling stock, Kiyoshi Nakata, said that he hopes it will boost the company’s presence in Russia, as well as the Commonwealth of Independent States – a political and economic confederation of nine former Soviet Republics. The JV will use Metrowagonmash’s manufacturing capacities to make the traction inverters in Russia. It will have an annual production capacity of 200 traction systems and carry out the design as well as manufacturing, assembly, testing, sale, repair and maintenance service of the products. Transmashholding general director Kirill Lipa, who also signed the deal, said that the joint venture is a logical step to further improve its relationship with Hitachi.